July 6th Update: That was quick! It looks like Wex has already dropped the free accessories from this offer, but it is still running at Park Cameras. If you don’t want to miss out on future offers, then make sure you are signed up to my deals email. This is the best deal I’ve seen for UK Alpha Shooters since the Sony a9 was launched. 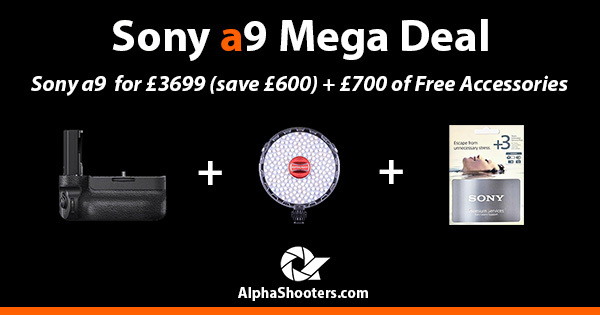 You can currently save £600 on the Sony a9 (£3699 instead of £4299), plus you also get the Sony VG-C3EM Battery Grip worth £329, a Rotolight Neo II LED Light worth £299, and a 3 Year Extended Warranty worth £79 bundled for free. The offer is currently running at Park Cameras, it was also running at Wex Photo but they have since dropped the free accessories from the offer. With the free products this is a total saving of £1307. I wish I’d waited a while before buying my own a9! I’m not sure how long this deal will last for, so if you are tempted I wouldn’t wait too long! If you are thinking about the a9, then you might find my a9 vs a7 III comparison helpful. I’ll be writing an a9 vs a7R III comparison very soon.